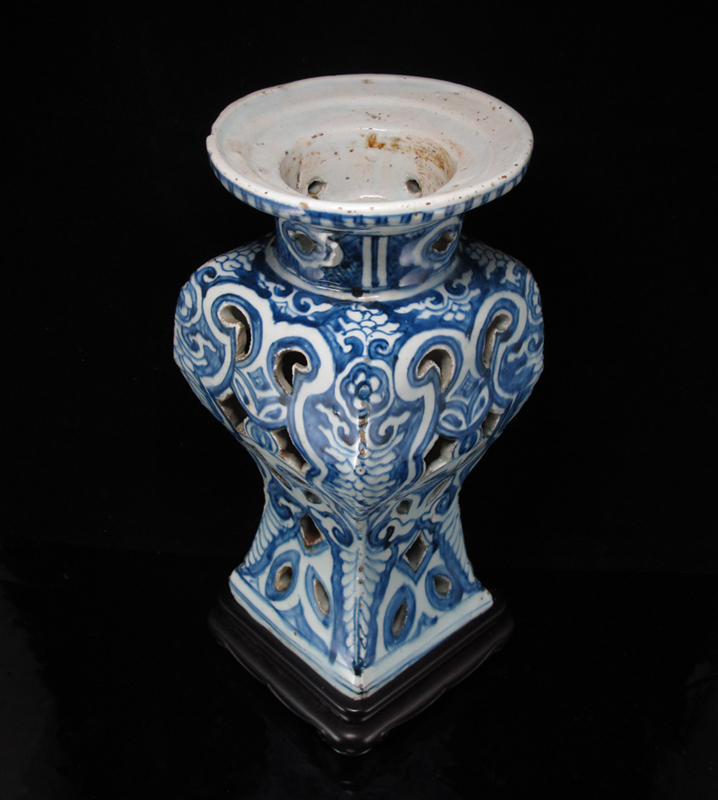 An unusual late Ming blue and white incense stand or vase, of unusual reticulated form, with a circular cupped rim and neck above a square-sectioned body, the curving walls partially undercut and painted with cloud collar lappets above elongated leaves on each corner that frame a cash-shaped roundel to the center. 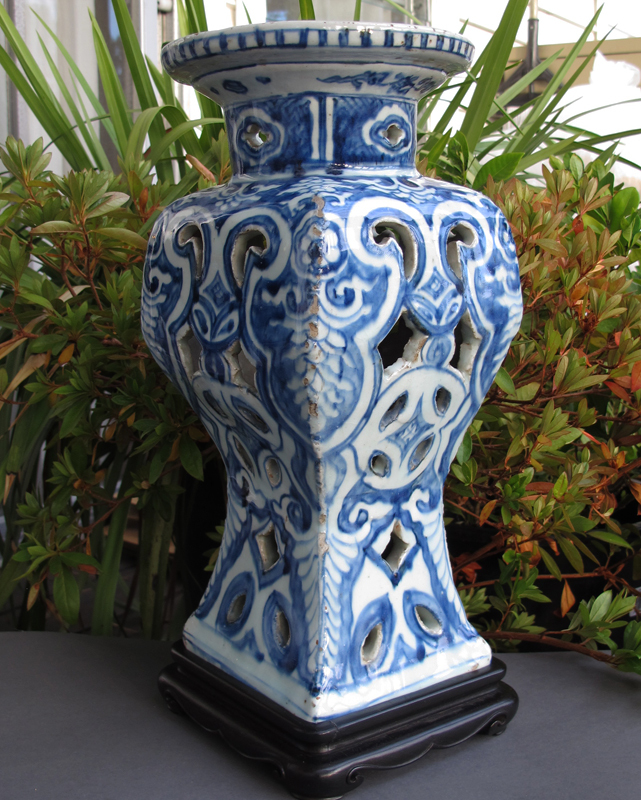 Reticulated / open-work porcelains usually appear in the form of small bowls and cups. 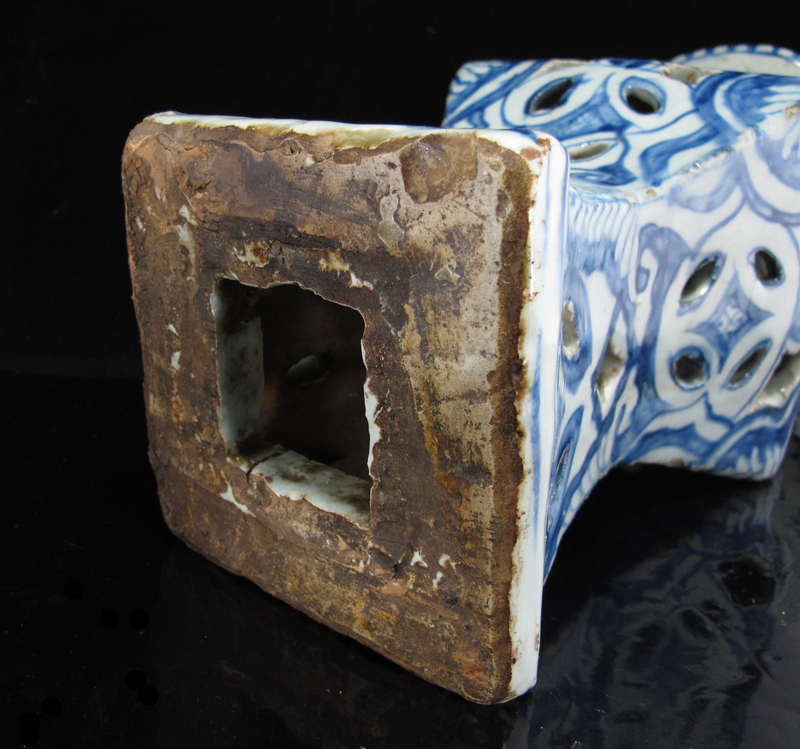 Large objects such as this vessel would have been extremely hard to fire, as the weakened open-work body was aptly to collapse or warp in the kiln. 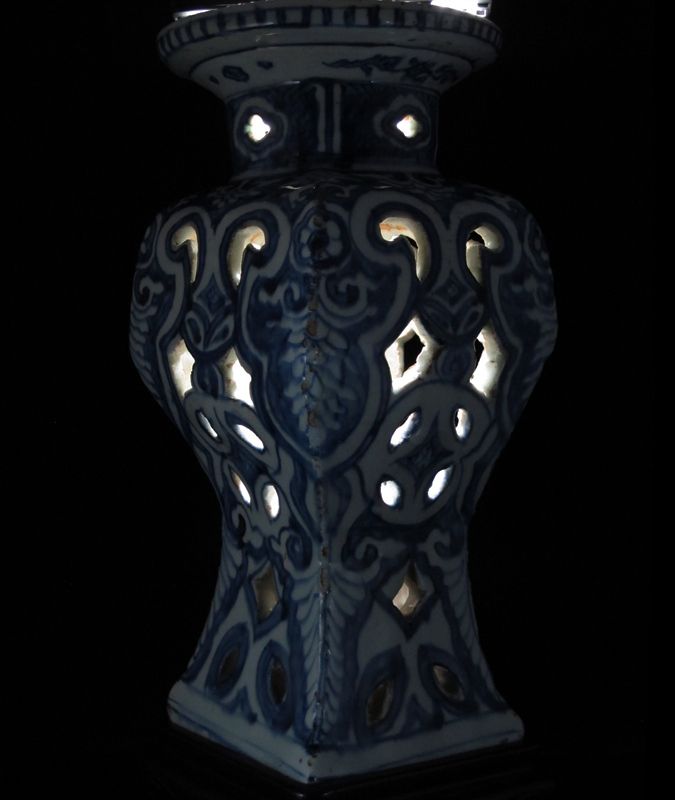 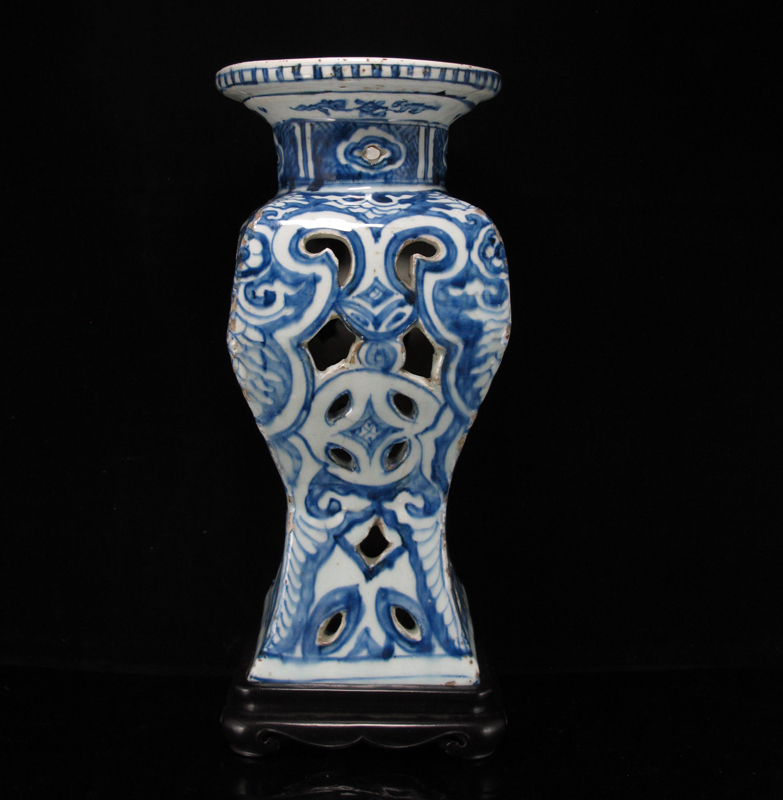 This vase-stand did in fact warp in the kiln due to its large size, and stands slightly lopsided. 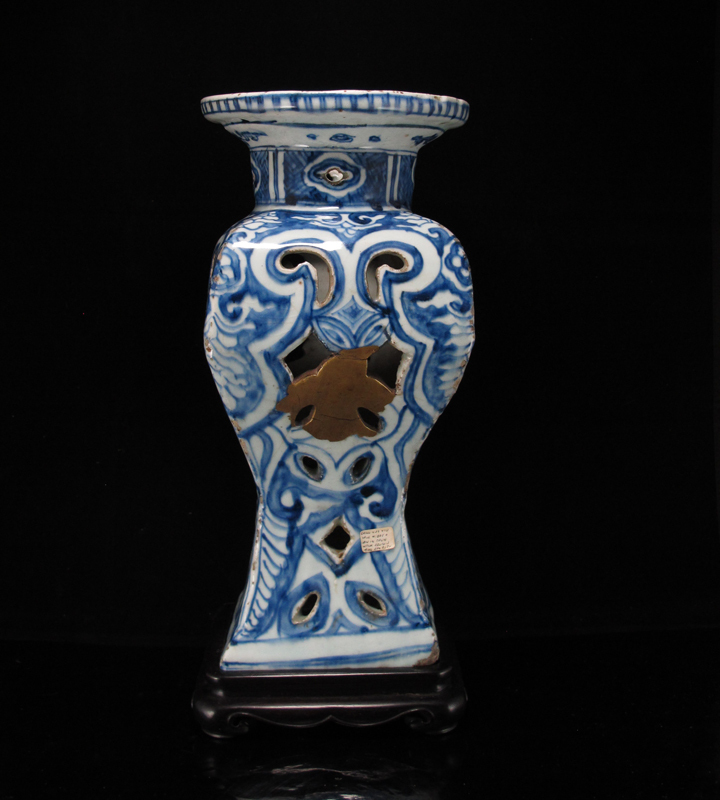 To solve this problem, a previous collector had a custom wood stand with a tilted base made, so that when the vase is placed on its stand, it appears to stand straight. 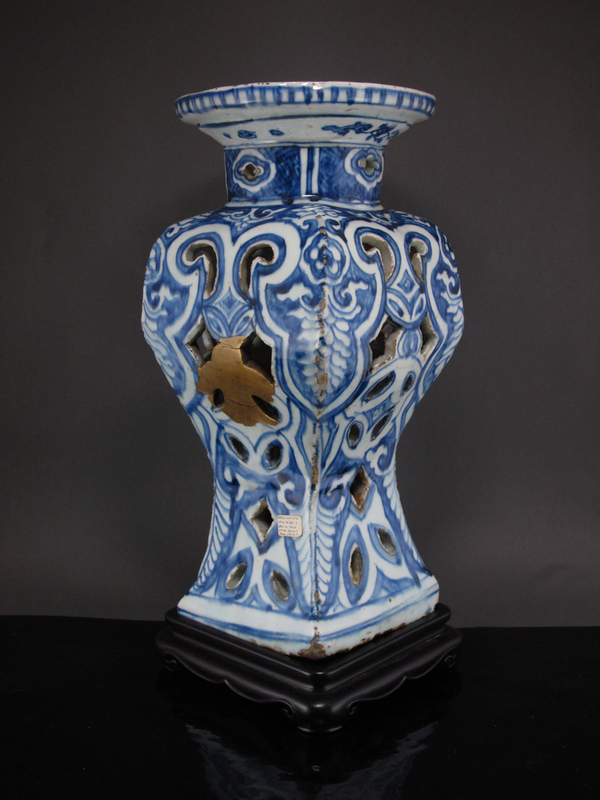 According to British Museum curator Jessica Harrison-Hall, reticulated vase-stands such as this were most likely made to hold incense; its pierced, open-work shape would have allowed incense smoke/fragrance to leak out its body and permeate throughout a room. 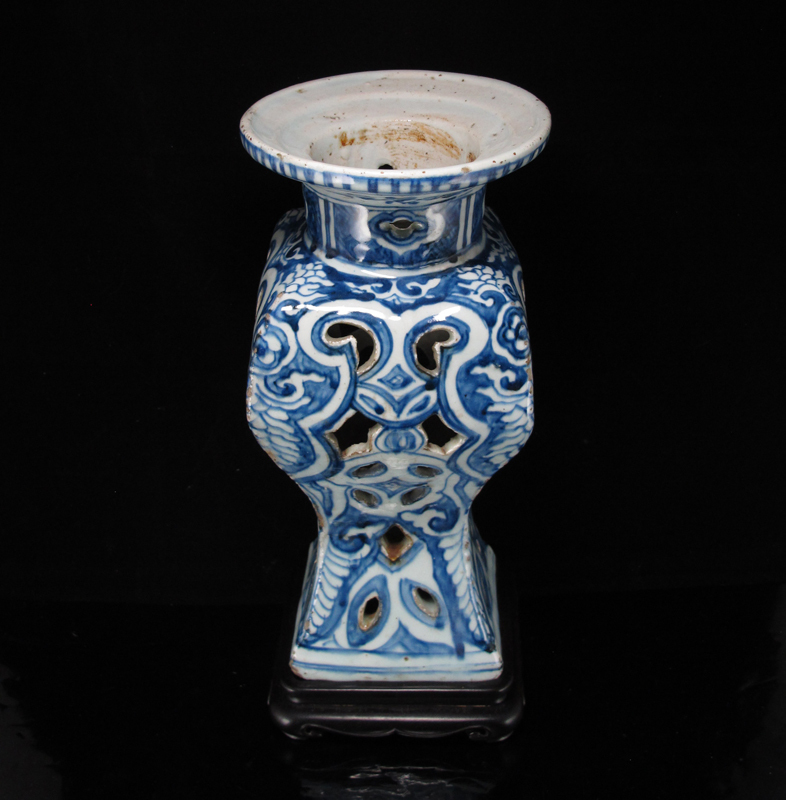 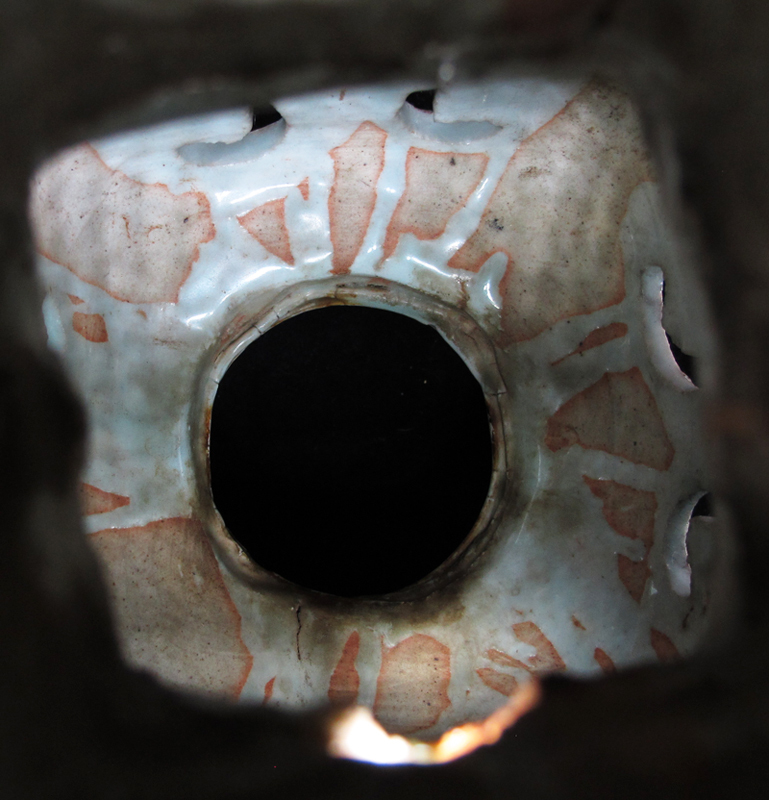 The base of this vase-stand still carries traces of mortar; it’s likely that it was once attached to a regional temple or monastery, and was hacked-off and sold during the decades of unrest following the collapse of the Qing dynasty. 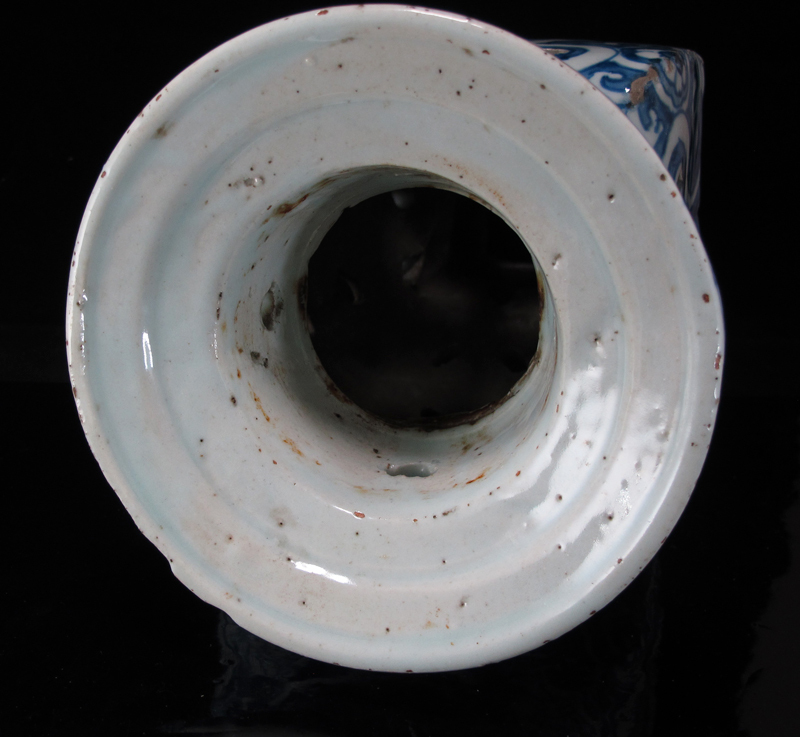 For a Ming Longquan reticulated incense stand, see British Museum Franks.1666. 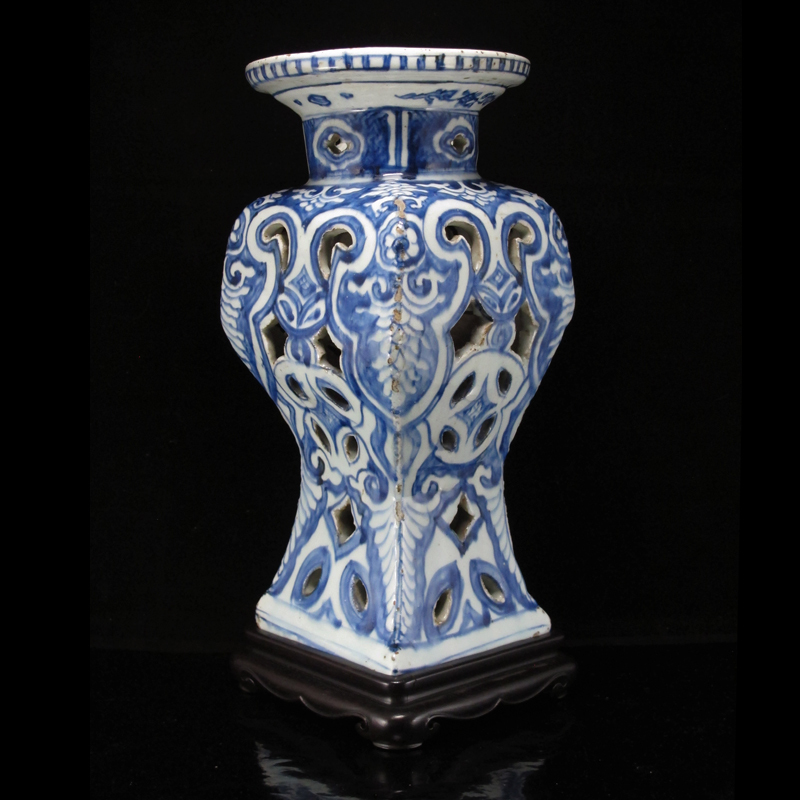 For an earlier blue and white reticulated vessel, see Christie’s Sale 7084 Lot 9.